As I’ve said before, I know that having people over for a party or even a mellow dinner can be intimidating and stressful for people. There’s a lot to think about… what to serve… when to serve it… do we have enough to drink… is the house clean? It can be hard. 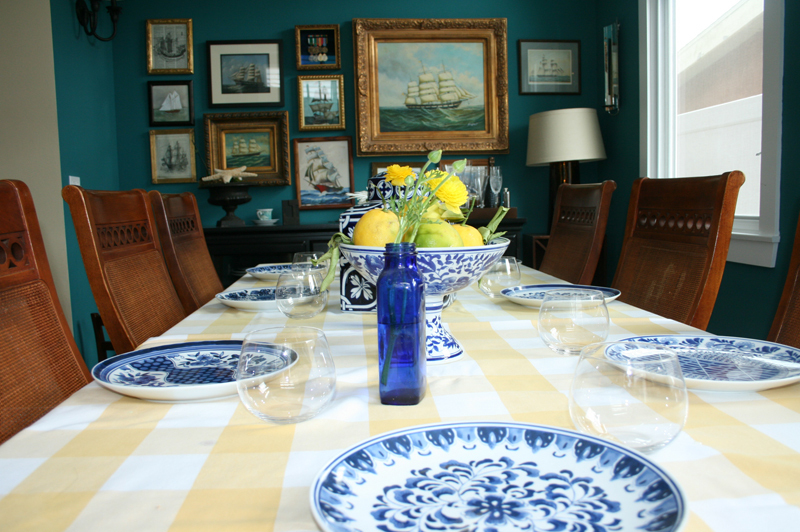 One way you can simplify your gatherings is when it comes to setting the table. 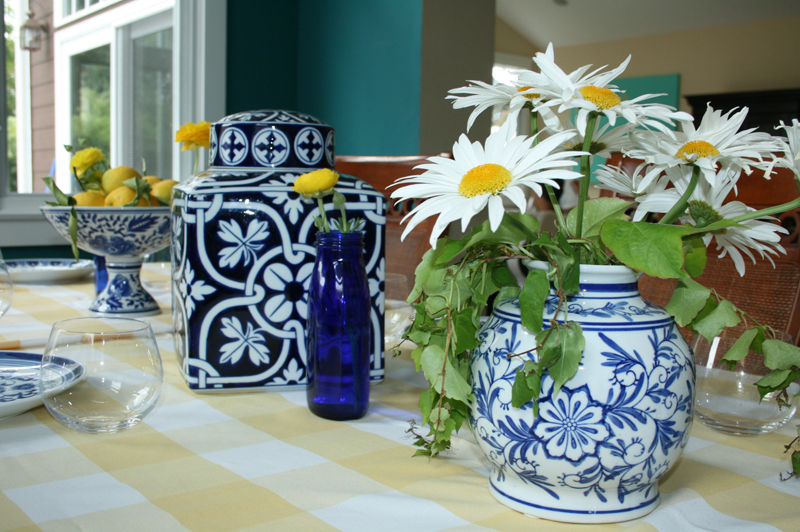 Take a look around your house and see what you already own that may be a cool centerpiece. 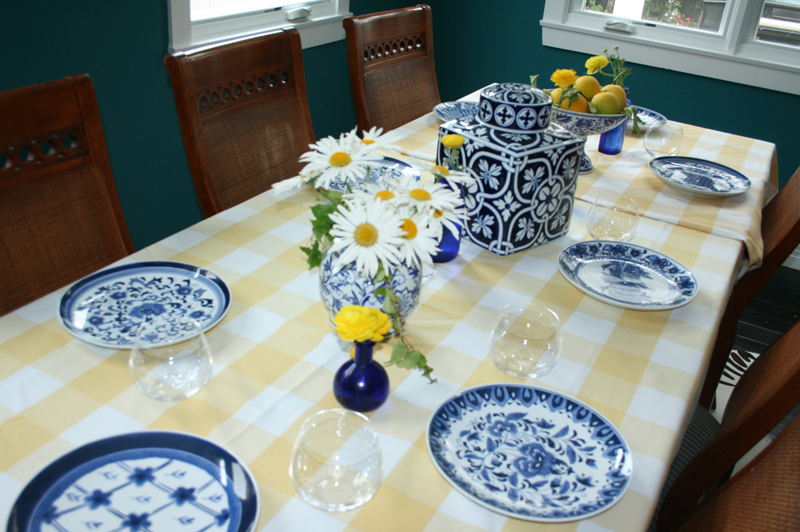 Buy a tablecloth that looks good with your every day plates so that you will always have a “go-to” party look. 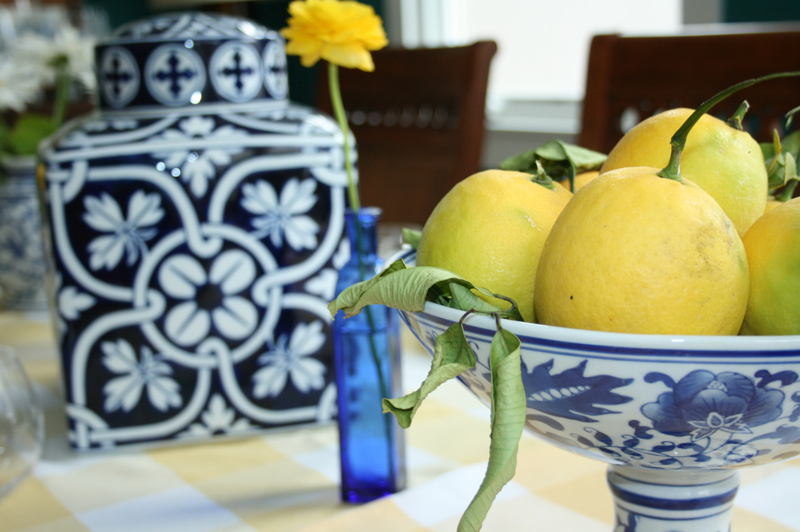 Instead of rushing out to buy flowers, go pick lemons from your neighbors house, or daisies from your own front yard. Everything in these photos are things we (or my parents) already had around the house. Having fun every day plates makes dressing them up easy, and clean-up a cinch. No hand-washing fine china means more time with your friends. I forgot to put the napkins and utensils down before taking these photos but we used paper napkins so no washing there either. (I stock up on napkins at places like Tuesday Morning or Home Goods from time to time, so I always have them on hand.) 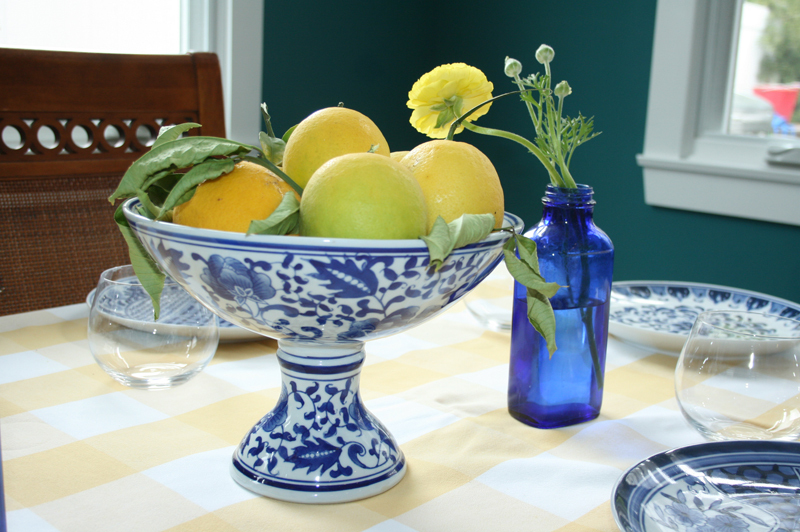 Obviously you surround yourself with things you like to look at in your home, so why not repurpose them for parties? That collection of old mason jars you have could make beautiful vases. Putting your unicorn collection together in the center of the table for your diners’ viewing pleasure would be a hoot. Stacking books with a simple bulb vase and a single flower on top would be lovely. The point is make it easy. Make it funky. Don’t over-think it. Just have people over. Party mellow, my friends. It’s better than not partying at all! 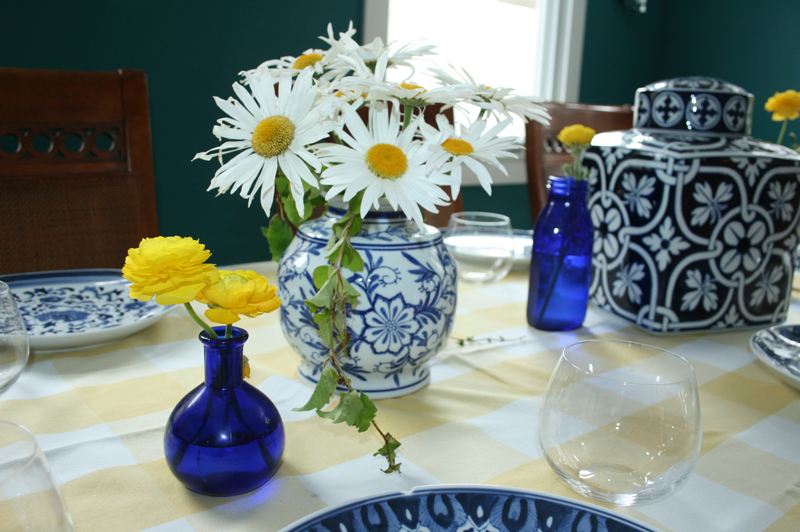 This entry was posted in party mellow and tagged blue & white with yellow flowers, blue & yellow party, blue yellow and white party, blue yellow and white shower, daisy centerpiece, lemon centerpiece, yellow tablecloth by Annika. Bookmark the permalink. I love your idea of using what you have when you throw a party rather than going out an buying a bunch of new stuff….. But one question, what if what I have isn’t as cute as yours…can I borrow yours?? ?